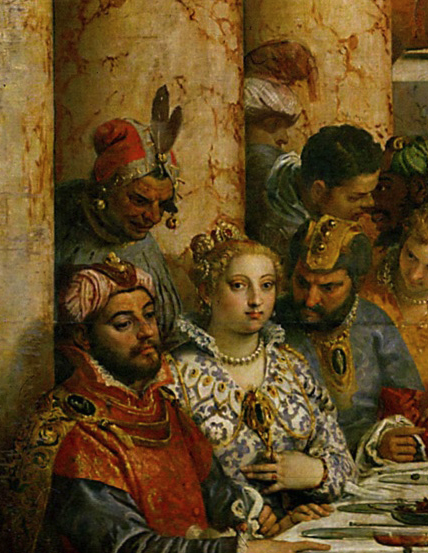 The Wedding Feast is a 450 year old painting by the late Paolo Veronese. 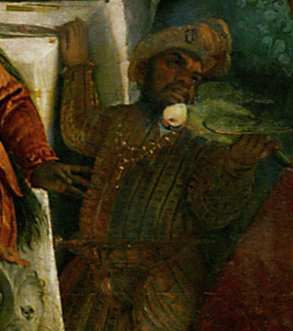 The piece was commissioned in 1562 by the Benedictine Monastery of San Giorgio Maggiore in Venice, Italy, and completed in fifteen months by the year 1563. It hung in the refectory of the monastery for 235 years, until it was plundered by Napoléon in 1797, and shipped to Paris. The painting was cut in half for the journey and stitched back together in Paris where it remains as the largest painting the Louvre (22ft tall by 32.6 ft long). 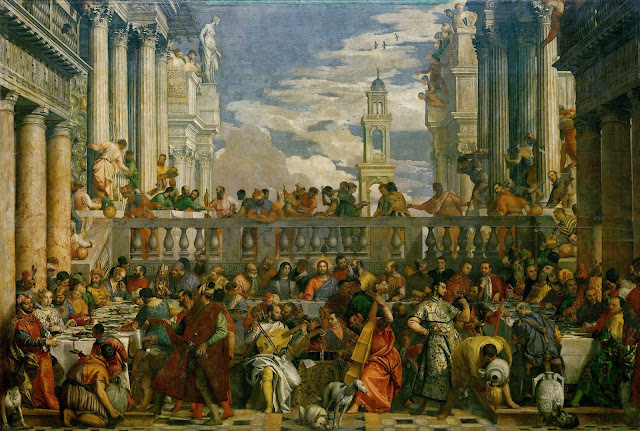 The painting itself depicts the first miracle of Christ, it is said that during the feast, the wine was running out so Jesus asked the water vessels be filled with water and brought to him, upon which you turned them to wine. I just love the detail of this painting, and I have a thing for parrots. While searching about the net on this piece, I came across this interpretation of the biblical story. I really don't care if it's true, but, this is the kind of God I believe in and makes me want to complete this puzzle! It was such a wonderful wedding feast! The music, the dancing, the food and wine. 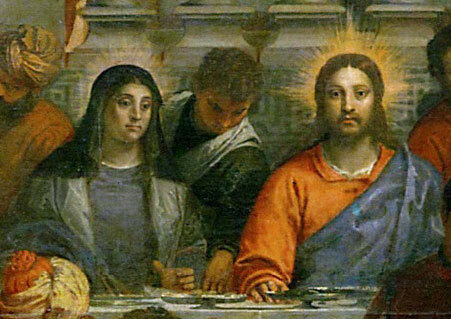 There was a burst of joy just then and Mary looked over at a table where Jesus and his companions had gathered. Jesus had finished his story and the whole table had dissolved in laughter. Mary shook her head with a smile. He captivated people with his stories. She leaned against the tall, empty water jars as she watched. Her heart filled with such love as she looked at him. She remembered how thirty years ago, she and Joseph had carried the newborn into the temple in Jerusalem. An old man named Simeon had come up to them and asked to hold their child. With tears in his eyes, he held the baby aloft, thanking God. “I have seen your salvation!” he prayed. Anna, one of the temple ancients, had heard Simeon and joined them. She, too, prayed aloud in thanks, and then began waving bystanders over to see the child. Mary and Joseph exchanged glances and wondered again at this child. She and Joseph had talked about this after they left the temple and in the years after. They knew that Jesus was sent by God. She remembered the words of Gabriel. But he was also just … Jesus. He was their little boy who had played in the sawdust of the workshop, run through the streets of their tiny town with the other boys and learned his scriptures. She had not pushed him into marriage, even though most of his friends were long since married. She would love grandchildren. Jesus would be such a good father, as Joseph had been. But as she prayed for freedom in her heart, she knew she could only follow the choices Jesus made. And so a few months ago, Jesus had left home, saying he needed to teach. She had blessed her son and sent him out with a prayer. Since he left home, she had heard from some of her kin the story of Jesus’ baptism at the River Jordan and the clouds parting and the voice saying, “This is my beloved son. With you I am well pleased.” They were astonished at it, but when Mary heard the story, the truth of it rested quietly in her heart. Of course. She was suddenly brought back from her memories to this wedding feast by the whispers next to her as the groom looked wildly around. “Out of wine? How could that be? !” he asked. He knew that it would be a dishonor on his bride and her family to run out of wine at their wedding feast. He looked frantic and lost. Mary saw Jesus stroll outside into the courtyard and she walked out to join him, stopping him with a little hug. “Joshua,” she said tenderly, using his childhood nickname. He wrapped his arms around her and put his cheek to hers. “Imma,” he said warmly, using the most familiar form of Mother. “Are you enjoying yourself?” he asked. She nodded at him and searched his face and the warm, dark eyes she knew and loved so well. Today she sensed something different in him and in herself. She felt divided. She wanted to keep him close, to protect him, to be with him. She didn’t want to let him go. Then suddenly, she knew. Standing there in the courtyard embracing her son, she understood. It was his time. She looked up at him. “Joshua … they have run out of wine.” It was all she said. He looked past her into the house at the family and saw from their discomfort that it was true. Their host was having whispered conversations with headwaiters, servants and uncles all at once. “Imma,” he said then paused with an imperceptible shake of his head. “I’m not …. It’s not….” He stopped and looked into the dark eyes that matched his own. “Not yet,” he hesitated. She walked back into the house and said softly to the servants, “I know you need some help. Just do whatever Jesus asks you to do.” They looked bewildered but nodded their heads. After a while, Mary saw Jesus return to the house with a deep serenity in his eyes. He walked up to two servants and gestured to the water jars lining the walls. “Fill these with water.” They were confused – the ceremonial washings were already over. Who needed more water in these jars? But they did as he asked. “Now, draw out a cup” he said gently, “and take it to the headwaiter.” He walked back to his table. It made no sense but they remembered Mary’s words and so carried a brimming cup to the headwaiter. He took a sip, glanced over at their full jars and smiled for the first time today. “Where did you get this?” The two servants looked at each other open-mouthed but the steward didn’t wait for an answer. She watched the bridegroom’s puzzled face but the steward had already turned away, giving orders to the servants to serve the wine. The music began again and the bridegroom shrugged and rejoined the festivities. Mary felt joy and peace. As she moved to rejoin the women’s table, she glanced over at the servants. They were whispering to other servants and pointing to Jesus. It had begun. His life would never be the same. Neither would hers. She sat on the end of the bench and paused for just a second, quietly opening her hands on her lap, whispering, “Behold, I am the handmaid of the Lord.” Then she turned back to the women at the table. Are you going to do Life section by section? The idea of mixing it all together first is so tempting for me now, but I just know I'd never get it finished that way. I'm so excited for you to have gotten the "holy grail" of puzzles that you've been searching for. It finally showed up today.... in rough shape, but what the heck, I will try it anyway.